Lucky247 Casino promises to provide the absolute highest standards in online casino gaming. The player is supposedly invited into „a world of winning". At the same time, the main site does not look very inviting. It looks downright bleak with its black background. Nevertheless, it's the content that really deserves to be judged. When it comes to the casino offer, a number of things stand out upon examination. First of all, the instant play games are a substitute for the more typical software download. Secondly, the casino is mobile-ready, which will satisfy all players who possess a mobile device. Thirdly, the hassle-free registration process makes the casino attractive to individuals who have no time to waste on lenghthy sign-ups. The promotions section features a wide variety of Lucky247 Casino Bonus deals. A deposit match offer is provided for users. It covers the first three deposits up to $/€/£500. 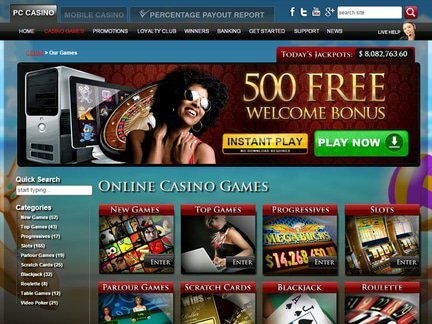 Fifty free spins are provided along with the 500 free welcome bonus. Daily cash bonuses are also available. For example, the casino celebrates the month of January by providing opportunities to win cash on a daily basis. Winning $5,000 in cash is likewise possible with the Fill Up Promo. Alternatively, the Cash Bonus Countdown allows players to claim a 50% match up to $300. The whole section is packed with many other promotions, so it's good to check back with the site to receive future updates. Making a deposit won't be an issue. Many payment options exist on the website. They would include; MasterCard, Visa, Skrill, Neteller, Euteller, Instadebit, PaySafeCard, Skrill, Poli, iDeal, and a few others. The privacy of each player is respected. Al online transactions are protected by the 128-bit SSL digital encryption technology. The website has put out a statement concerning the eligibility to play real money games. It turns out that the residents of the following locations are forbidden from accessing real money games. Here is the „black list": Belgium, Denmark, France, Israel, Italy, Singapore, South Africa, Spain, South Africa, and the United States of America. The visitor should head over to the terms and conditions section in order to see a full list of restrictions. The casino has a connection to Malta through its license. Therefore, it also has a connection to the European Union. The currency support shows that the casino is open to receving players from different parts of the globe. At this point in time, the website hosts forty-one games in the „top games" section. Here is just a sample of the games in that category; Lucky Twins Slot, Peek-a-Boo Online Slot, Hot as Hades Slot, Jurrasic Park Slot, Basketball Star Slot, Scray Friends Online Slot, Bullseye Video Slot, Stardust Online Slot, Serenity Online Slot, Immortal Romance, Happy Holidays Online Slot, Bridesmaids Slot, Mermaids Millions, Ariana Online Slot, Pistoleras Slot, Dragon's Myth Online Slot, Castle Builder Slot, Ladies Nite, Avalon, Girls with Guns, Santa's Wild Ride, Deck the Halls, Tomb Raider, Battlestar Galactica, Atlantic City Blackjack Gold, Max Damage Online Slot and Gung Pow Online Slot. The other game categories would include; Video Poker, Table Games, Roulette, Blackjack, Scratch Cards, Parlour Games, Slots and Progressives. There have been complaints concerning the apperance of the games in the browser (some of the games are apparently slow loading). The casino has also been accused of payout avoidance, which is particularly irritating for online casino players. As a result, the casino has a low ranking in player's reviews. Some major changes are needed for a restoration of reputation. All inquiries can be made to the staff via Skype, live chat, e-mail and phone. The casino was established back in 2013. Play Central Ltd is the owner of the casino. It has obtained a license from the Malta Gaming Authority. The licensing body has a generally good reputation. Holders of the license can advertise in the UK, since the casino has been white-listed. While the casino has a decent license, it has not found approval among members of the online casino community. I believe that the casino will need to take the complaints more seriously, if it does not want to disappear from the radar. It's the treatment of the players which constitutes the biggest problem. In my opinion, the games and promotions are actually quite good! It's too bad that a casino with a fine license has become the subject of such criticism.